The Lloyd's Patriotic Fund, which was originally established as the Patriotic Fund, was inaugurated at a meeting on the 28th July 1803 at Lloyd's Coffee House. On previous occasions Lloyd's had raised money for casualties and their dependants at various actions but this time the Patriotic Fund received support from all over the British Empire. In fact, by March 1804, the Fund had received over £174,000, a massive amount by the standards of the day. The Patriotic Fund Committee was not only able to grant money to the wounded and give annuities to the dependants of those killed but also to reward those who distinguished themselves with "successful exertions of value or merit". These rewards took the form of a piece of plate, a sword or a sum of cash. A competition was organized for the design of these rewards and that put forward by John Shaw was selected for a handsome vase. There was no prize given for the design of the sword but the contract for making them was given to Richard Teed of Lancaster Court, Strand, London. There were to be three types of sword awarded. One of £100 value would be given to commanders and naval captains, the £50 sword was given to naval lieutenants and Royal Marine captains and a £30 sword was awarded to midshipmen, masters' mates and Marine Lieutenants. The design of the ormolu stirrup hilt of each sword was identical, the knuckle-guard is in the form of the club of Hercules entwined by a snake, the quillons are Roman fasces, the langets are cast with acanthus foliage and applied with naval trophies, the back-piece is in the form of the Nemean Lion skin. The grip is of chequered ivory. The blade is of the type fitted to the British 1796 Pattern Light Cavalry sabre. 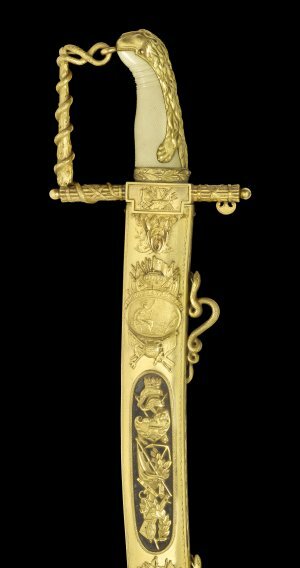 The £100 sword blade is etched, blued and gilded with foliage, naval trophies, the Royal Arms and cypher, and the figure of Britannia. The £50 blade is similar but not quite so ornate and both have the presentation inscription on one side in gilt Roman capital letters against a blued ground. On £30 swords the inscription is etched and gilt against a matt ground. The main differences between the swords are in the scabbards. The £30 sword has a shagreen covered wood scabbard with three gilt mounts each engraved with naval and neo-classical motifs. The £50 scabbard has gilt mounts joined by scalloped side pieces to form two panels on each side of the scabbard lined with shagreen. The mounts are engraved and also applied with oval cartouches depicting various Labours of Hercules. The £100 scabbards are similar except the panels are lined with dark blue velvet which are applied with ornate gilt stands of arms and at the top there is an oval panel decorated with the seated figure of Britannia and above is engraved the name of the recipient's ship. 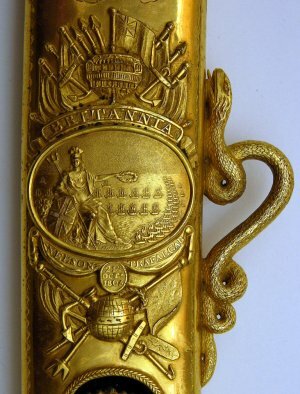 On the £100 swords given to Trafalgar captains the scabbards are also inscribed with the words "Nelson, Trafalgar, 21st October 1805" in drapes below the top panel. Also the £100 scabbards have suspension mounts in the form of scrolling dragons instead of loose rings on the lower grade swords. There are some variations between swords of the same value, especially on those produced after the official presenting of rewards ceased. Each sword came in a mahogany case with brass escutcheon engraved with the recipient's name and the name of his ship and was accompanied by a blue and gold bullion sword knot and a sword belt, that for the £100 sword being more ornate than for the others. Inside the lid of the case was a label which explained the classical iconography of the hilt. Each recipient also received a letter sometimes referred to as a certificate or citation with a beautiful engraving of Britannia and a lion surrounded by naval trophies above a hand-written address to the recipient detailing the action concerned. These were hand written by young boys from Christ's Hospital, London. In 1970 May & Annis published a list of Patriotic Fund swords. Since then swords have appeared that were not included on this list and others have been shown not to exist. The "new" swords are generally late pieces. At a General Meeting of Subscribers held on 24th August 1809 it was decided to concentrate on awards to the wounded and dependants of those killed and discontinue awards for merit because of the huge demands being put on the Fund by the battles in the Peninsular War. However, some officers who were awarded sums of money for wounds received applied to the Fund for permission to have a sword with suitable inscription made. Generally the officers ordered the swords directly from Teed, but, in the case of Captain Brenton, the Fund paid Teed directly and Captain Fleming of the 31st Regiment received a mameluke hilted sabre made by Brun. It must be borne in mind that over sixty officers chose to receive a piece of plate instead of a sword. Also a number decided to accept their award in cash. In some cases this was for charitable purposes such as distributing to wounded crew members but some must have just preferred to take the money. The idea of this website is to trace as many swords as possible. No doubt over the last 200 years some will have been lost or destroyed but the fact that they would have been impressive and treasured items means that the majority are sure to have survived. Of the 133 swords traced, 81 are in private collections (68) and family ownership (13). The remaining 52 swords are in museums and public collections. The largest collections are the 13 swords held in the Lloyd's of London collection and 13 swords (6 of which are Trafalgar swords) held by the National Maritime Museum. This is followed by 7 swords at the Royal Naval Museum in Portsmouth and 4 swords at the Royal Marines Museum in Southsea. The primary objective of this website is to discover if there are further swords out there and the authors sincerely hope that collectors, curators, researchers and dealers will make contact with information surrounding further sightings or knowledge. In this endeavour we will absolutely protect confidentiality and are not seeking to know any details of current ownership or location rather the existence of the sword. It is intended that this website will be regularly updated as new details emerge.